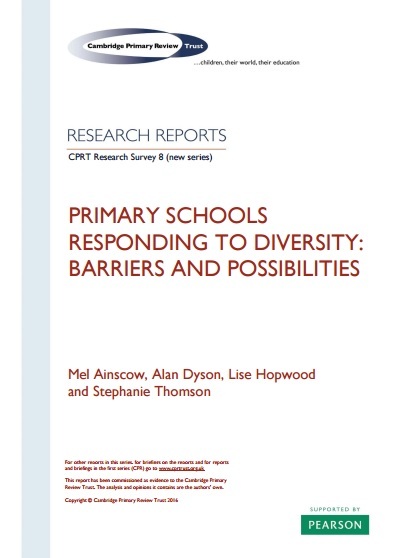 Ainscow, M., Dyson, A., Hopwood, L., and Thomson, S. (May 2016) Primary Schools Responding to Diversity: Barriers and Possibilities. York: Cambridge Primary Review Trust. 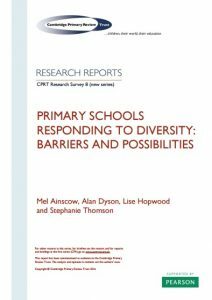 This review will portray the current and developing demographic context in which primary schools work and to which they must respond. It will (i) outline population increase and migration from EU countries and the wider world, including countries in Africa and the Middle East; (ii) consider the growing challenges of transient school populations, especially in urban areas, of multi-lingual classrooms, and of inclusion, equality and social cohesion; (iii) consider how these translate into specific childhood needs to which teachers must respond; (iv) comment on trends and concerns associated with radical movements, Islamic and otherwise; (v) assess the responses to all these changes and developments of government policy.